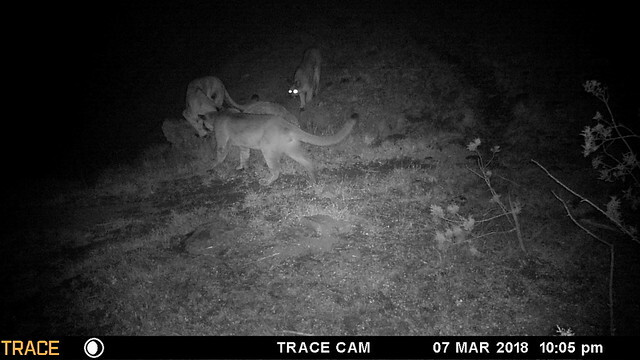 Got 2 coyotes and a good trail cam picture! 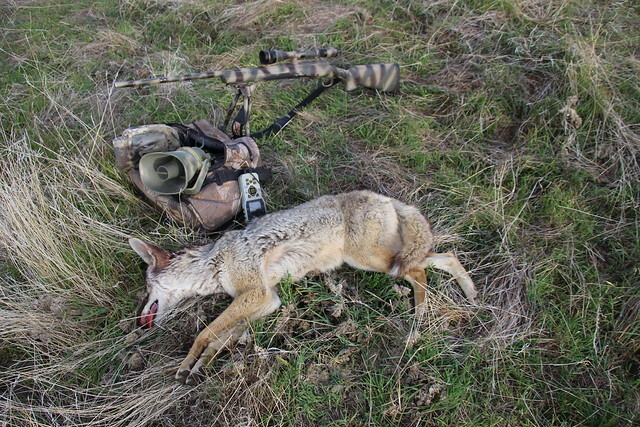 Yesterday I went out to pick up 3 trail cameras and do a little coyote calling. For the first 5 hours I did not see or hear any coyotes. At about 2:00 pm I made a rifle calling stand into a big open bowl or valley with my truck parked back behind me just out of sight. 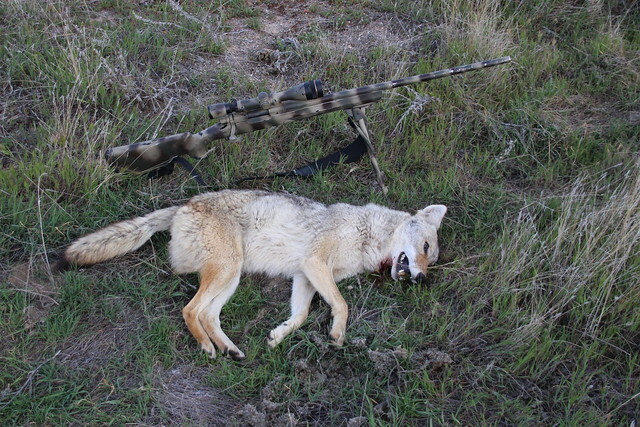 I was laying down prone with my 22-250 and I set my FoxPro about 40 yards bellow me and a little to my right. I started out with Female Coyote Sore howls and played it for about 2 minutes. After a 2 minute pause then I played Female deep Howls for about 2 minutes. After another 2 minute or so pause I started playin Nutty Nuthatch on full volume. After 4 or 5 minutes of playing Nutty Nuthatch I see a coyote running down the mountain beside me heading away and it is going to run right by my FoxPro. This coyote had been spooked and would be out of sight over a ridge in 10 seconds or less. I pushed my #1 pre-set button that is Coyote Pup Screams on volume 40 and the running coyote stopped and looked towards my FoxPro. It was a easy standing shot for my 22-250. I am pretty sure this coyote worked it's way around the mountains side hilling and popped over a small ridge and saw my truck about 50 yards away and then ran over the main ridge and down into the bowl right next to me. I am pretty sure the coyote didn't smell my truck, me or my FoxPro and carry bag. On my way to make one last stand I spotted a coyote about 250 yards away right in the middle of a bunch of cattle that were spread out in a big flat area. This coyote thought he was hidden. I could see part of his shoulder and his neck and head. This picture below was the best picture I got on my trail cameras. I sure hope I call one of these in some day. Just knowing they could be there sure makes shotgun calling exciting when I can only see 25 to 40 yards. Wow, that last pic is great. I can tell that ain't Mass! Thanks for sharing your hunt and pictures. I'm amazed at the last picture, especially with three together. Hope u can call one in. Congrats, nice shooting. I would put my caller at least 20yds out if I were calling those cats LOL. Very interesting, thanks for sharing your hunt. Thanks for sharing your hunt and pictures.